CLICK ON A PICTURE FOR DETAIL ! This Set of 2 DVDs contains 11 instructional Videos that you can play on your computer or in your home DVD player. 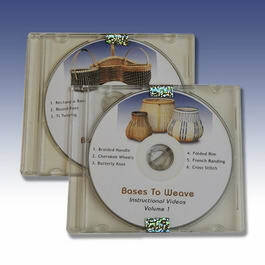 Great to have as a reference for often used weaving techniques, and makes a great gift as well. Our website is a catalog of the many Kits and Patterns that Bases To Weave sells, the Bases, Handles, and Accessories for those Kits, as well as pictures of Baskets created by Debbie and Candace. There is a menu bar at the top of each page that provides a path to each available page. Just click on the desired menu selection. We use a Shopping Cart System like many of the web sites you may have visited, BUT, we don't actually process transactions online. This means that there are no security issues with your credit card numbers. When you are ready to "Check Out", your order will be compiled and a confirmation email will be sent to you. We will then process your order and contact you by phone for safe passing of credit card information. Like many of you, we found quality wood bases and components difficult to come by. So we decided to do something about it! We have assembled a nice selection of quality wood products which augment our patterns and will make a Nice basket turn into a Really Nice Basket. 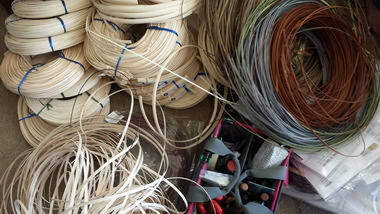 And now, we can supply quality hardwood components for the baskets we are designing. 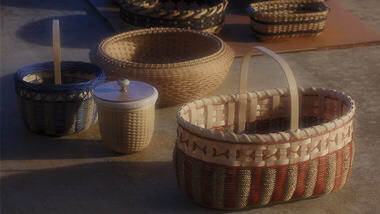 We are members of the Arkansas Basket Weaver’s Guild. We teach basket classes together. We buy basket supplies together. We do craft shows together. We design unique and exciting baskets together. Due to factors beyond our control, reed prices have risen again. Because of this, beginning June 1, 2014 we will raise our KIT prices, some a little, some a little more.